First of all, coroutines are not threads and coroutines are not asynchronous. Since coroutine is not multi-thread it will be executing on the main thread of the game, it will then be the only thing in the core game code running at that time. You never need to worry about synchronization or locking values when you are programming a coroutine. It runs until it hits a yield. At this point, the coroutine is placed on the coroutine stack of the MonoBehaviour object, then back to the calling method and on with the program. Update is called and returns, then the program looks in the MonoBehaviour list of coroutine and finds our pending TestCoroutine and gets back where it left off, the yield statement. The same is processed over and over again until the end of the coroutine if the while condition is not met or the end of the MonoBehaviour object. That loop will never execute again if you make a call to stop the coroutines on the game object and it will not run again if the object is destroyed. It will also be paused if the script is disabled directly or by using SetActive(false) on the game object. This clearly shows the link between the MonoBehaviour and the coroutine. The coroutine will run until hitting a yield, then the object is destroyed, the coroutine object is also destroyed in the process. You may be thinking that it doesn’t in case like yield return new WaitForSeconds(1). 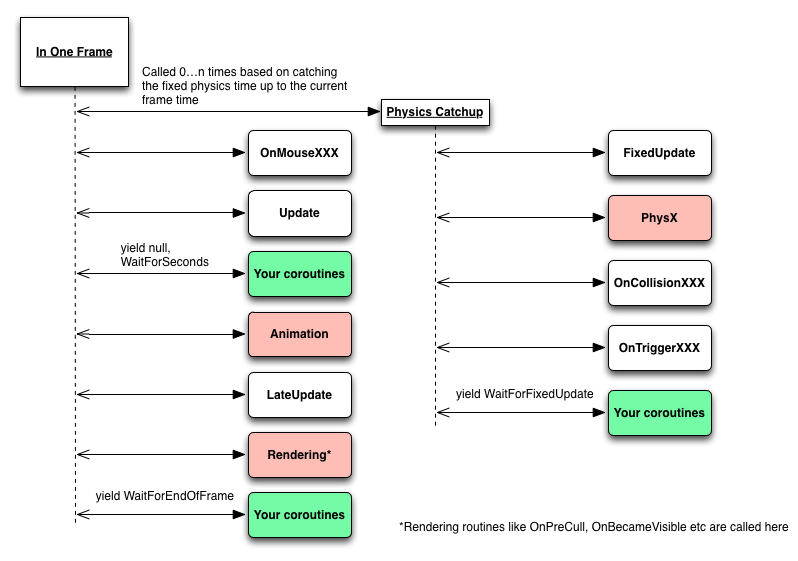 Unity does process that coroutine every frame, checking to see if the right amount of time has elapsed – it doesn’t process your code, but it does process the coroutine which is the wrapper it’s made around your script. Because of WaitForEndOfFrame, coroutines can be used to get information from render textures when all cameras have completed rendering and the GUI has been displayed. The second example makes use of a string parameter and one object parameter. This was useful before Unity allowed to stop a coroutine with IEnumerator. The only way was to call with a string and stop with a string. This process only allows one parameter (or then a bunch of them wrapped in an object). The second case is a little more tricky, a call for the method is made and it returns a IEnumerator object. coroutineObj is a reference to that IEnumerator object, we pass it to StartCoroutine which actually starts the coroutine. With this solution, we are able to stop a single coroutine. Note that it is stopped, not paused, it won’t start again from where it left off.